Information About the STL Pipeline | Spire Inc.
We will construct 59 miles of new build underground pipeline in Illinois and build six miles of underground pipeline in Missouri, referred to as the North County Extension. Spire STL Pipeline will further improve reliability and better serve customers and communities across Illinois and Missouri. As an interstate project, the Spire STL Pipeline has been reviewed for siting and permitting by the Federal Energy Regulatory Commission (FERC). The FERC will be the lead agency for other federal and state, and local permitting authorities. The pipeline will be wholly owned and operated by Spire STL Pipeline LLC. We rely on natural gas to live our lives to the fullest and run our businesses efficiently. We count on it to keep us warm when the nights turn cold. For cooking and cleaning, making and manufacturing, pipelines fuel our homes and our businesses, empowering our communities and the economy. The new Spire STL Pipeline, once constructed, will provide significant benefits to more than 647,000 homes and businesses in the entire St. Louis region. We’ll create more diversity in our energy supply providing even more competitive pricing for natural gas customers in the region. The pipeline will also enhance reliability and earthquake resiliency and create new commercial and industrial growth opportunities in the region and along the proposed route. With the Spire STL Pipeline, we’ll provide customers in the St. Louis region with the natural gas they need to run their homes and operate their businesses. As an open-access interstate natural gas pipeline, it will provide the area’s gas and electric utilities, municipalities, independent power generators and large commercial and industrial customers with a new and abundant source of natural gas to serve their future demand needs. During construction, towns and cities along the proposed path will benefit from increased economic activity. From hotels and restaurants to gas stations and retail stores, it’s a plan that supports local businesses along the way. Once construction is complete, customers will benefit from lower-cost gas for years to come. According to the American Natural Gas Alliance and IHS Global, the average American household saved an estimated $926 each year between 2012 and 2015 thanks to the affordable abundance of natural gas. These savings are estimated to increase to more than $2,000 per household in 2035. Knowing and understanding communities is at the heart of the work we do. When we know what they need, we can better serve them in the future. The Spire STL Pipeline allows us to better serve communities within the St. Louis region and beyond. An expanded natural gas system allows communities to thrive. And by providing homes and businesses with improved access to clean burning natural gas, we contribute to better air quality and reduced emissions. What’s better for the environment is also good for local businesses. By investing in new infrastructure in southwest Illinois, we’ll create long-term opportunity for commercial and industrial growth. Opportunities that didn’t exist before and won’t exist without it. Commerce and industry look first for energy to fuel the businesses that will need local employees to help them grow. Here’s a look at our schedule. 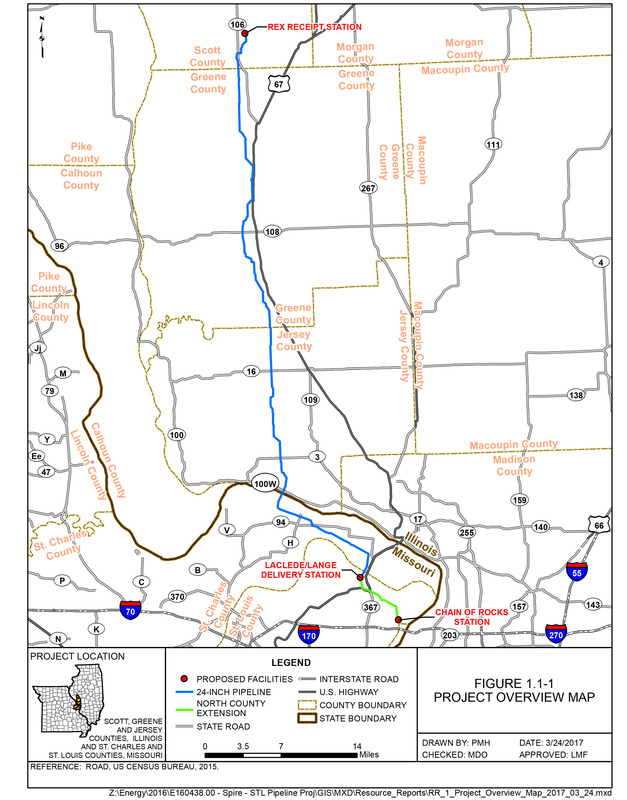 The 65-mile steel pipeline will interconnect with existing Rockies Express Pipeline in Scott County, Illinois. From there, the pipeline will travel through Greene and Jersey Counties in Illinois and St. Charles and St. Louis Counties in Missouri before connecting with existing Spire facilities. From there, the pipeline will travel through the north portion of St. Louis County for six miles before terminating at the Enable Mississippi River Transmission Line. Spire has conducted civil, environmental and cultural resource surveys along the proposed path to identify the best possible route with the greatest protection to sensitive areas. Sharing ideas helps us all. In August 2016, we held five open houses to give community members a chance to learn more about our proposed pipeline project. We invited landowners, elected officials and the general public to share ideas, review maps and speak with our project experts. The Federal Energy Regulatory Commission (FERC) held three project scoping sessions about our proposed project in November 2016. Click here to read the official Notice of Intent for those sessions. Thank you to everyone who participated in the open houses and FERC scoping sessions. We assure you that we’ll continue to be active and engage with all affected landowners and communities along the proposed pipeline route. If you have any questions or comments, please call or email us anytime. The only way to do the job is to do the job right. It’s not just how we dig, but how it affects the community. During construction we will make every effort to minimize your inconvenience. Working with Federal Energy Regulatory Commission (FERC) and other regulatory agencies, we will develop plans to minimize noise, dust and traffic issues. We will work with local communities to create safety and traffic plans to insure that safety remains the number one priority. Construction doesn’t end until the landscape is restored. Weather permitting, restoration efforts begin as soon as possible after construction work is complete to restore the land. We use a two-phased approach. First is “preliminary grading” to backfill the trench. Next is a "final grading" process to smooth out and clean up the area, planting grass seed and other native vegetation, and restoring any necessary drain systems. Restoration measures are monitored and maintained until the area is similar in nature to its original condition. Pipeline construction sequence: Land surveying, clearing, grading, trenching, pipeline stringing, bending pipe, welding, x-ray and repairs where necessary, coating where necessary, lowering the pipe, installing valves and fittings, back-fill, testing, clean-up and restoration. Download this image here. The Federal Energy Regulatory Commission (FERC) is the lead federal agency in charge of overseeing the permitting process for interstate natural gas transmission pipelines. To guide its decision making process, FERC conducted a comprehensive environmental review of the project, in accordance with the National Environmental Policy Act (NEPA). Throughout this process, FERC worked closely with other federal, state and local agencies. Landowners and the general public also had numerous opportunities to participate in the process by attending public meetings and providing public comments to FERC. Before the formal environmental review of the project began, Spire STL Pipeline spent more than a half year engaging with and gathering input from stakeholders in what is known as the FERC pre-filing process. Once the pre-filing process was completed, Spire STL Pipeline filed an application for a Certificate of Public Convenience and Necessity with FERC, which initiated the formal environmental review of the project. The application described the purpose and commercial need for the project, the transportation rate to be charged to customers, proposed project facilities, and how the company will comply with all applicable regulatory requirements. Spire STL Pipeline evaluated project alternatives, identified a preferred route, and completed a thorough environmental analysis. FERC then reviewed the application in order to evaluate the need and overall impact of project construction and operation, and will summarize its findings in an environmental review document. In August 2018, FERC issued a certificate authorizing construction of the Spire STL Pipeline project.